Located in the heart of Europe, the Universitair Ziekenhuis Brussel (University Hospital Brussels) is one of Belgium's premier Centres of Excellence in healthcare, biomedical research and medical education. The hospital is closely associated with the Vrije Universiteit Brussel (Free University Brussels). As a top-rate hospital, the Universitair Ziekenhuis Brussel has gained recognition at both a national and an international level. With its 700 beds, close to 30,000 inpatients and 500,000 outpatients are treated every year. Although the busy metropolitan centre of Brussels is only five minutes away, the hospital lies in a quiet and peaceful area next to the beautiful Parc Roi Baudouin and the Laarbeek forest. Brussels Airport is approximately 10 kilometres (seven miles) away, thereby guaranteeing fast and easy transfers from and to the hospital. The origins of the UZ Brussel date back more than 30 years to the founding of the hospital in 1977. Since those days, UZ Brussel physicians and researchers have made countless contributions to the practice and science of healthcare. The legacy of innovation continues today with state-of-the-art clinical programmes in virtually every medical speciality and subspeciality, including reference treatment centres such as the Fertility Clinic, the Cardiovascular Centre and the Oncology/Radiotherapy Department. As an integral part of academic medicine, UZ Brussel's clinical departments are always kept up-to-date through dozens of ongoing research projects. Laying the foundations for further advances in healthcare, our hospital ensures that laboratory discoveries are quickly implemented in medical practice at the patient's bedside. Numerous international teaching and research programs (HRMC, IVF, Diabetes, Oncology, Disaster Medicine). Open to everyone: Our primary concern is that quality medicine should be available to everyone and without undue financial impediment. Open to everyone: We respect all beliefs and creeds, every philosophy of life and religious conviction, as long as these are respectful of one's fellow man. Open to everyone: The official language at UZ Brussel is Dutch. In practice, however, we speak many languages (50% of our patients do not speak Dutch). Most importantly though, we speak the patient's language. Scientific practice by an integrated team of compassionate, multidisciplinary physicians, nurses and other allied health professionals who are focused on the true needs of the patient and scientific education of physicians, scientists and other healthcare professionals. This makes UZ Brussel a reliable source of knowledge for our patients and the public alike. We undertake research, both basic and clinical, to improve patient care. Commitment to Quality... We strive constantly to enhance all processes supporting patient care, education and science. Commitment to society... We want to benefit the public through our medical services and support the communities in which we work and live. Commitment to our employees...The work atmosphere we want to create for our staff revolves around keywords such as teamwork, responsibility, integrity, innovation, trust and communication. We endeavour to ensure all of this (and more) within the context of a physician-led institution. 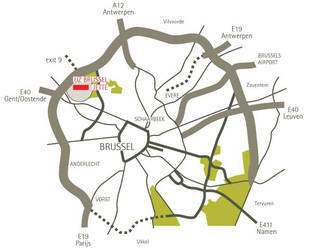 Brussels National Airport lies only 10km (7 miles) away from the hospital. The easiest way to get from the airport to the hospital is to take a taxi. All international trains arrive at the Brussels 'Midi' station. The easiest way to get from the railway station to the hospital is to take a taxi. The Laarbeeklaan can be accessed from the Brussels ring road (R0). Coming from Zaventem on exit 9, follow the Steenweg op Brussel and turn left. At the next traffic lights, turn right and drive onto the Dikke Beuklaan. Follow the signs to UZ Brussel. Coming from Gent on exit 9, follow the Dikke Beuklaan and turn right. Follow the signs to UZ Brussel.